Britain's highest-decorated serving soldier has criticised the government for failing to help ex-servicemen and women suffering mental health problems. 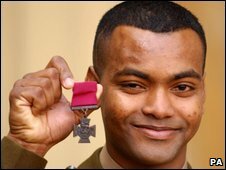 Lance Corporal Johnson Beharry, who was awarded the Victoria Cross, said it was "disgraceful" that some veterans struggled to get treatment. He told the BBC the Army provided "first-class" treatment but ex-soldiers were forced to wait on the NHS. The Department of Health said it was piloting new ways of treating veterans. 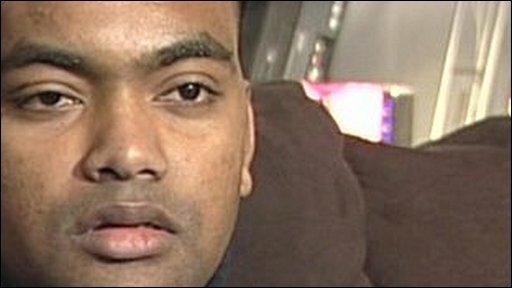 L/Cpl Beharry, who was given the VC for twice leading comrades to safety during attacks in Iraq, called on the government to give more help to his comrades suffering from post traumatic stress disorder, depression and mental breakdowns. The 29-year-old told BBC Radio 4's Today programme he has to live with constant pain, nightmares, mood swings and unexplained rages, five years after receiving a serious head wound. Yet he had to wait three hours in hospital to see an NHS doctor about his trauma. "A lot of soldiers get discharged from the Army and have to be on the NHS for treatment. "Having experienced it as a serving soldier, what it's like being on the NHS, I feel it's ridiculous because these ex-servicemen and women would not get that treatment they really need. What's going to happen to them?" Mental symptoms can take a long time to surface and they are harder to deal with in civilian life, he said. "[In the Army], we have places to go and get the help at the moment but my worry is that ex-servicemen and women, if something like that happens to them and they have to wait two to four hours on the NHS." Earlier, in an interview with the Independent, he said it was "disgraceful" that those who had served their country in Iraq and Afghanistan were forced to wait for NHS treatment and charities had been forced to step in where ministers had failed. "You spend six months on the battlefield and you have to defend yourself every day and then you come back to normal life and go to Tesco and someone runs into your trolley. "You have to stop and think - it is only a trolley, you are not on the battlefield." General Sir Richard Dannatt, head of the British Army, said: "Ex-servicemen and women are cared for by the NHS. "They should have a priority. Government policy is that they have priority within the NHS and I should hope that the NHS managers remind themselves of that." But Col Bob Stewart, a former British commander with UN forces in Bosnia, said that supposed priority was a myth. "They keep saying that you go to the top of the list... but the truth of the matter is you don't," he told the BBC. "You don't do that and actually I believe the Ministry of Defence, and the Veterans Agency in particular, has got to build up a department that actually follows people that have been mentally or physically hurt for the rest of their lives and looks after them." A spokesman said the Department of Health was working with the Ministry of Defence on "improving information on how veterans' health needs differ from those in the population more generally". He said priority treatment had been extended to all military veterans whose care was required as a result of their military service. A range of pilot schemes had also been implemented in the past year to "better identify and treat veterans with mental health problems and ensure continuity of care for those discharged from military service". Defence Minister Kevan Jones also insisted his department was "not complacent" about the issue. "We recognise mental illnesses as serious and disabling conditions but also ones that can be treated," he said. "Our dedicated psychiatric teams based in theatre provide the very best diagnosis and treatment of psychological illnesses both during and after deployments." Figures published by the MoD in November showed nearly 4,000 new cases of mental health disorder were diagnosed among armed services personnel in 2007. They also showed personnel sent to Afghanistan or Iraq were more likely to suffer post traumatic stress disorder. Robert Marsh of Combat Stress, a mental health charity for ex-servicemen, said: "I think to be fair we work in partnership with the MoD as much as we can. Last year they gave us round about £4m in respect of war pensioners that we are treating. "But I think that going forward, the demand on our services is going to be ever-increasing and there is going to be a funding challenge and perhaps we need to question where we are getting our money from." The Mark Wright Project, a charity set up in honour of Cpl Mark Wright who died in Afghanistan in 2006, is raising funds for a dedicated veterans' rehabilitation centre in Scotland. Chairman Neil Innes said: "We feel it is not right that they have to rely on the NHS. "Injuries suffered in battle can be completely different to those in Civvy Street and our brave men and women require special care." Shadow defence secretary Liam Fox said there was "a bow wave of mental health problems building up". "We need to understand that our duty of care lasts a lifetime," he said, "And that in areas such as mental health we need to find ways of picking up problems which may take years to manifest themselves." Lib Dem defence spokesman Nick Harvey added: "The government is slowly waking up to the problem, but this testimony shows how far they have to go before we get close to dealing with this very serious issue."